Teksupport have made a name for themselves as top promoters in New York’s underground scene, continually bringing cutting-edge and legendary artists to the East Coast. They’ve lived up to their high booking standards by bringing back Sven Väth after his long hiatus from the States for a special showcase around his celebrated club night, Cocoon. Its been almost three years since we've seen Sven Väth’s name on a New York billing, making his return truly momentous and all the more special. Fans know him as “Papa Sven,” as the German DJ has been shaping modern dance music since it exploded during the 1980s. Early hits like the seminal “Electrica Salsa” along with his group Off shot him into the global spotlight, while his labels Eye Q and Harthouse became pioneering forces for house music, techno, and trance. His name has consistently topped billings at the world’s most iconic venues and festivals, including Love Parade, Time Warp, Awakenings, Berghain, Tresor, Twilo, Amnesia, and Pacha. Cocoon began in1996 and has since grown into one of the biggest entities in clubland. Sven poured his entire savings into this party series and has since evolved into an Ibiza mainstay, booking agency, and record label known for launching the careers of Dubfire, Loco Dice, Martin Buttrich, and many more. 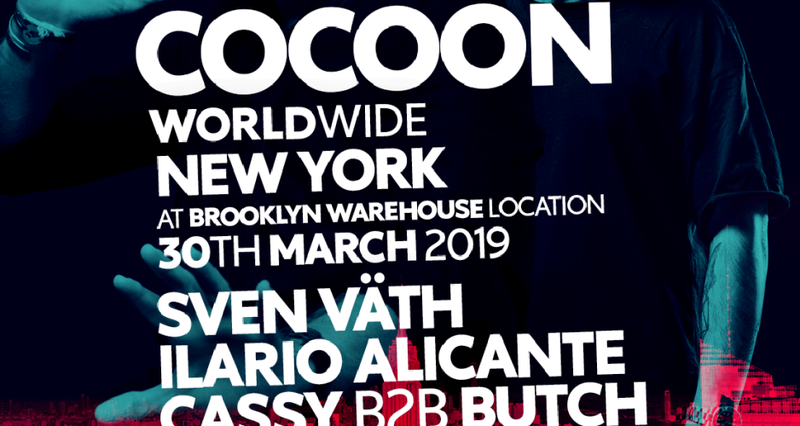 Come March 30, Sven is bringing Cassy and Butch along with him for a special b2b, plus Drumcode up-and-comer Ilario Alicante for his American debut, and Taimur for his Cocoon takeover in Brooklyn. Teksupport has quickly risen to set the standard on producing warehouse events, boasting unwavering dedication to hosting the world’s best DJs in raw spaces with top-notch production. Since their beginning, Teksupport has brought groundbreaking brands such as Time Warp, Circoloco and Solomun +1 to NYC while also hosting an array of artists that includes Jamie Jones, Seth Troxler, Maceo Plex, The Martinez Brothers, Adam Beyer, Marco Carola + many others.